In the provincial city of Tver, volunteers are lending a helping hand to the police in tackling hooligans, rowdy neighbors and smokers, as well as assisting in resolving domestic disputes. What do residents of a city do when the resources of its police force become so stretched that it is no longer able to cope with the demands placed on it? The provincial city of Tver (174 km northwest of Moscow) provides an example of one solution: Faced with public disorder or disagreements of a domestic or communal nature, local residents are able to call for assistance from a local group of druzhinniki, or vigilantes, called Afanasy. 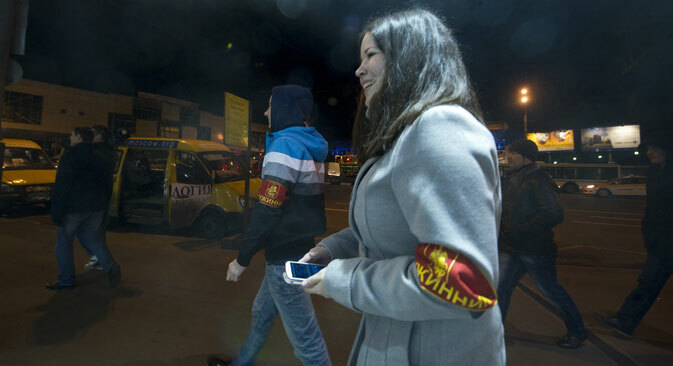 Afanasy vigilantes typically receive requests to come to apartment blocks to resolve disputes of various kinds or intervene to prevent unruly behavior.Volunteer Pavel Volkov says that they receive up to 20 calls and letters every day. “If it is something urgent, the duty team is dispatched immediately,” he says. Most of the calls that Tver vigilantes get are complaints against noisy gatherings and smokers, who are impervious to appeals from either the police or neighbors. “We explain to them that they are not alone and ask them to be quiet. We try to raise their awareness, and leave them with some specialist literature about the laws and liability that follows if they violate laws. That is all that we can do. In many cases, it proves enough,” says Pavel. The vigilante squad consists of volunteers and is open to all. However, its core is made up of employees of a private security firm that belongs to a local councilor and businessman, Maxim Larin. He pays a small stipend to some of the activists, although money is not the main motive for joining the vigilante group. “We want to get out onto the streets, to show that we are for tidiness and order, for good,” says vigilante Zelimkhan Berzukayev. The vigilante squad consists of 80 people, who are broken down into smaller groups. Their leader is Akhmat Chergizov: “I spent 10 years working as a policeman and I have never received so much gratitude from people as I do now, as a vigilante,” he says, explaining that in addition to domestic rows, the vigilantes also resolve ethnic conflicts. The squad comprises members of different ethnic groups, which improves its credibility with various diasporas, making it easier to resolve disagreements that may arise between them. The human rights ombudsman for the Tver Region, Vladimir Babichev, is also supportive of the volunteers: “We support any initiative that seeks to protect citizens’ rights and maintain public order. Provided that all their actions are strictly within the law,” he says. The squad gets involved in resolving various disputes such as domestic rows or rows with noisy neighbors – problems that the police are not always able to resolve. Afanasy member Ilya Zhukov gives an example of how a visit by vigilantes helped one estranged couple begin communicating again: “One day we were sitting in the kitchen at one woman’s place, drinking tea, and we listened first to what she had to say, then to what her ex-husband had to say – their row was about their child – and it so happened that it was the first time they had been able to have a conversation since their divorce,” he says.